Seven years ago, when my 20-year-old nephew died by suicide, one of the most painful things for his parents was the judgmental assumption many people made of his eternal life. At a time when his parents needed comfort the most, the long-held stigma of suicide created a reluctance to minister to them with the hope of salvation. What people forgot, however, was that this beautiful, young man was a believer. He was a child of God. Like many people who kill themselves, he suffered from depression. Yes, it caused him to sin. But no, it did not overrule God’s loving grace. And just as we are saved by this grace in spite of our sins, so was this young man. A book recently came out that my nephew’s parents recommend people dealing with suicide should read. 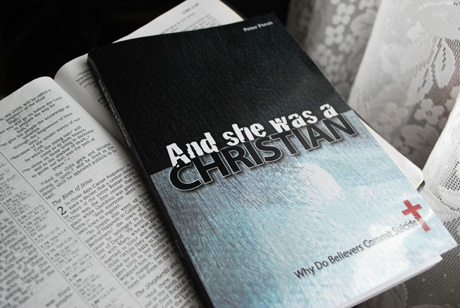 It’s called And She Was a Christian, written by Peter Preus, a Lutheran pastor. His wife also suffered from depression and committed suicide in 1994. This book must have been hard for Preus to write. He shares his wife’s story, from her days as a vibrant wife and mother, very involved in her church; to a woman destroyed by mental illness, very depressed and delusional. Preus also covers a historical study of the church’s viewpoint on suicide. Today’s Christians commonly believe the Bible makes a black and white statement on suicide, but according to Preus, this viewpoint wasn’t always shared. In fact, many early Christians committed suicide as an alternative to the “horrifying and humiliating forms of execution,” as Preus writes. It was St. Augustine, of the fourth century Catholic Church, who determined suicide to be an unforgivable sin. I found this quite interesting. Because this book is specifically intended for pastors and church professionals, Preus goes deep into the doctrinal aspects of suicide. I’m neither of those and I strive to maintain the “faith of a child” (meaning I intentionally shy away from debatable theological discussions). Admittedly, Preus is over my head at times. But he does make it clear, even to me, that Jesus’ dying on the cross is payment for every sin, even the sin of suicide. The book And She Was a Christian is a great for anyone who has experienced suicide among their family and friends–those who are suicide victims. And it’s certainly a “must-read” for anyone who ministers to suicide victims. This book is really good. I found it to be a comfort. My pastors told me my son was in Hell because “God would never use a sin to do His will.” I had never heard a pastor make such an ignorant statement! I was told by another pastor that the clergy tend to focus on the law when dealing with suicide instead of erring on the side of Grace. This particular pastor believed it was better to error on the side of Grace. The above book does a great job of applying Grace to the sin of suicide. This book doesn’t specifically address the topic of suicide, but it talks about how we minister to our fellow believer. According to the author, Church is where we should feel the safest when sharing our griefs, hurts, and shortcomings. Yet, church is the last place people are willing to expose themselves. The fear of being judged (shot) by their fellow believer is very often the reality they face. Why don’t suicide survivors want to talk about the loss of their loved one? Often as not, they are told they must have been bad parents or the suicide victim’s faith was not strong enough. This book talks about these types of ignorant statements and behavior. A number of good pastors have told me they are guilty of this, (unfortunately, those who really need it don’t recognize themselves), and the book has really helped them in understanding how to minister to those people in their congregations who are hurting. Don’t take my words as being pious. I have also been guilty of the same thing. This book has helped me lead a more sanctified life as I live to support and love those around me who experience life’s setbacks. The author sets forth the truths already found in the Bible, but in a very easy, clear and simple way. His application of these truths to our daily living is superb. I believe our churches would be well served if everybody, clergy and layman, would read this book and live it.